PRINCETON, N.J. – March 6, 2018 – PRLog — Entourage Yearbooks announced their 7th Annual National Yearbook Competition award winners in November of 2017. Started in 2011, this was the 7th year that the annual Entourage National Yearbook Competition has been held in recognition of schools with yearbooks created by students and school volunteers. To participate, schools had to submit their yearbook content into categories for overall yearbook theme, page design, photography, and cover design. Entries were submitted at the end of June and included over 800 Participants across all fifty states. Judging of the contest entries was based on a balanced rating across the dimensions of creativity, originality and journalistic relevance. Schools were judged at separate levels: Elementary, Middle School and High School. 1st through 3rd place winners in each category receive various prizes like cameras, yearbook cover upgrades, and Columbia Scholastic Press Association membership. “I’d like to offer my sincere congratulations to all of the schools that completed yearbooks and submitted entries into the yearbook contest this past year," said Entourage’s President Elias Jo. “Putting together a great yearbook takes a lot of time and dedication. The award winners represent schools who clearly went above and beyond on their yearbook and deserve recognition for their hard work. I’m personally blown away by the level of achievement this year." Mark Sylvestre and Jane Ramos of Vincent J. Gallagher Middle School, winners of awards for Book Design and Cover Design, said “It truly means a lot to us to receive recognition for our hard work and attention to detail. Our principal announced our achievement during a whole school assembly and the faculty, staff, and students cheered and clapped. Receiving this award will push us to continue to produce the best quality yearbook for the community of Gallagher Middle School families." Entourage will announce their 8th Annual Yearbook Contest for the 2017-2018 school year this coming May and expects over 1,000 entries for this year’s contest. 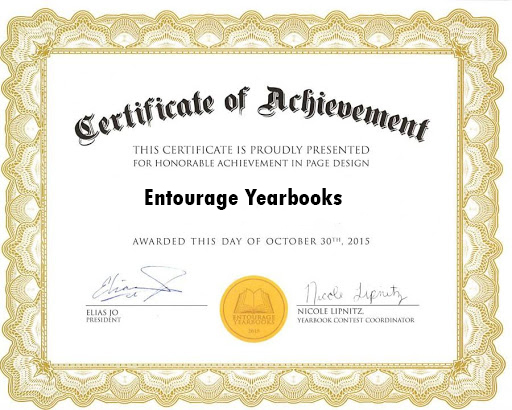 Founded in 2006, Entourage Yearbooks provides yearbooks to over 4,000 schools across the US and in 18 countries around the world. Entourage’s unique collaborative yearbook technologies and industry leading production times has made the company one of the fastest growing in the country, recently recognized by Inc. Magazine as the 17th fastest growing private education company in the US.